Foiled again! A chicken eyes the zip ties on top of the gate. Two weeks ago I moved the chickens out of the vegetable garden and into their summer paddock. The summer paddock is smaller than the garden, and not quite as rich in insects and diverse weeds. The chickens are always a bit put out at their restricted terrain, and they express their dissatisfaction for the first few weeks by escaping. When they get out, they immediately rake all the mulch from under the artichokes onto the paths. Then they attack the compost pile, spreading twitch roots, mouldy bread and last night’s leftovers around the yard. It’s a test of ingenuity between me and the chickens. At first, they might fly over the fence–I clip their wings. 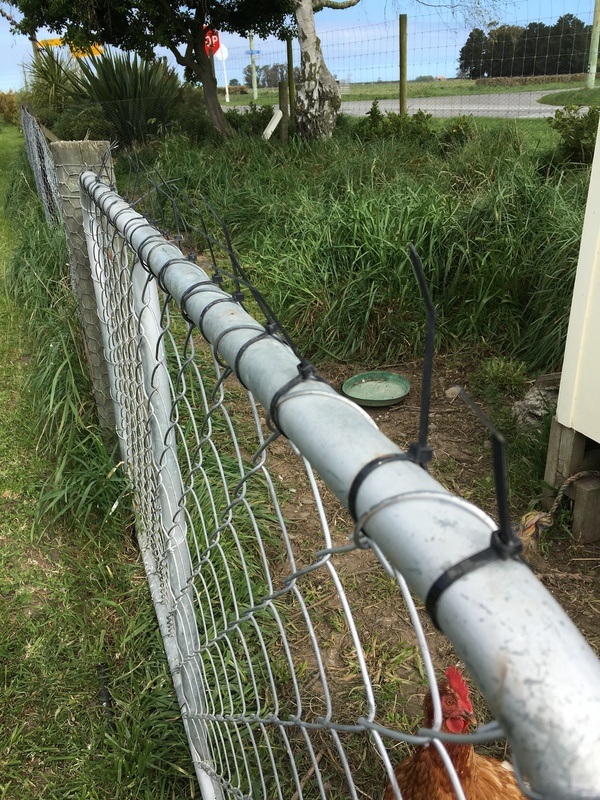 Then they might scramble to the top of the gate along the fence’s diagonal bracing–I use zip ties to create a jagged edge on the gate so they can’t perch there. Then they might use the nesting boxes as a perch, jumping from the ground to the nesting boxes, and then over the fence–I add zip ties to the top of the nesting boxes. In time, they might dig underneath the fence and slip underneath–I fill their holes with rocks. Eventually, they’ll grow tired of trying to escape. Or maybe they forget that they used to have more space–they have pretty small brains, after all. Either way, I will eventually win.